It is thin and flexible, and can be used on slight curved surfaces. 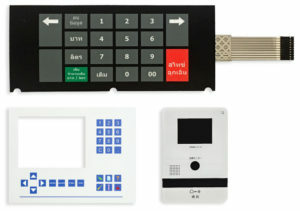 Membrane switch design can be integrated to use with various overlay materials, such as PC and PET, or, it can be integrated to use with silicone keypads. Polycarbonate (PC) and Polyester (PET) are available in gloss or textured. We can also selectively texture or selective gloss by screen printing. PET shows better life cycle (1 million cycles) and chemical resistance properties than PC, although PC is less expensive. Both are available with hardcoating for anti-scratch. And depending on your application, there are materials that are used specifically for outdoors that have good UV resistance, which means it will resist yellowing and there are also materials that are used in medical environment for its antimicrobial protection. There are many choices available to our customers, and the best way to match the correct materials to your usage environment is to give us a call and talk to one of our engineers. Quick and low cost tooling, economical and affordable unit price. Key buttons can be embossed, debossed or perimeter emboss to improve the aesthetic. When using metal domes, the overlay keys should be emboss. Braille emboss dots can be added as well. UV-cured epoxy drip buttons are another way to add a 3 dimension effect to your keys. These are done by an automated drip process, and by surface tension, the epoxy forms and UV cured into a dome shape. Another way, is by using a UV-imprint method which requires a tool to give the epoxy a more defined shape. The buttons can be tactile or non-tactile. For tactile buttons, the options are metal domes , polydomes or dome emboss of keys. Metal domes with a center opening for LED applications are also available. Perimeter-design switches are designs wherein a perimeter of continuous adhesive surrounds the membrane switch, and is used in applications where seal from water spray is required. If the membrane switch will need to be submerged in water, a perimeter-design along with a good choice of adhesive, and maximizing space between the edge to the closest key plus an epoxy or RTV of the tail connection will be necessary. Flex cable connector can be female connector, no connector with just carbon overprint for ZIF connectors, male pins or solder tabs.